Product prices and availability are accurate as of 2019-03-19 07:30:03 EDT and are subject to change. Any price and availability information displayed on http://www.amazon.com/ at the time of purchase will apply to the purchase of this product. In this practical guide, photography pricing guru Alicia Caine takes the anxiety and drudgery out of the pricing process for portrait and wedding photographers, showing how to keep the process as simple and painless as possible. Alicia starts by breaking down such daunting topics as managing your budget and expenses and determining how much work you can take on, and then explains the importance of understanding what your client wants and researching the marketplace. She shows how to reverse-engineer your pricing, create a pricing sheet, and present your pricing to your clients. Focusing mainly on portrait pricing, she also explores how to achieve consistent pricing across your photography services, with a chapter on specialty sessions that covers the particularities of pricing weddings and mini sessions. Along the way, you’ll encounter nearly 20 worksheets designed to help you move from learning the necessary steps and tasks to actual implementation, a key obstacle for many photographers. As an added bonus, Alicia provides an “Expert’s Guide” on how to get paid what you’re worth based on your expertise in a particular niche, which can potentially increase your value in the marketplace. In this special section, you’ll learn how positioning yourself as an authority on a particular topic can help you bring in more potential clients. Features the friendly, approachable voice of photography pricing expert Alicia Caine, whose mentoring and coaching have endeared her to thousands of photographers. Includes worksheets and a gross earning calculator (also available via download) to help you with key steps in the process, covering such topics as how to determine your hourly value, how to think about and set up collections and specialty products, how to figure out your costs of goods sold, and much more. 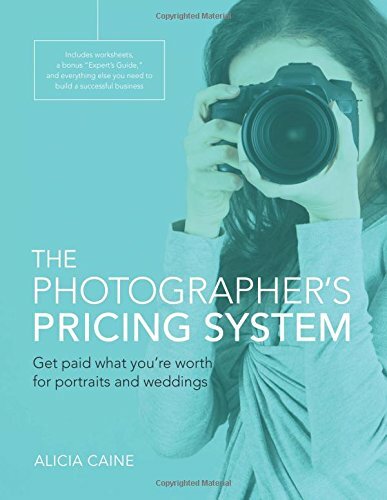 Incorporates lightness, fun, and compassion to help photographers more easily approach the challenging and often mundane topic of pricing.